Eureka, CA (August 22, 2017) – The 2017 season at Redwood Acres Raceway is quickly coming to an end. With only three weekends of racing left on the 3/8-mile paved oval, the battle for the track championship in all six divisons will likely come down to the wire. This weekend’s Anderson Logging Driver Appreciation Night at the Races will be one of the biggest of the season. The fight in the California State And Federal Employee’s Credit Union roadrunner class is likely between two drivers. Currently, Daniel Buell holds a narrow nine point lead over Nick Ford. Tim Ratzlaff has an outside shot at the championship as he’s 38 points behind Buell. Bob Ratzlaff and Jennifer Murrell round out the top five but both are likely out of the title fight. Sophomore driver, MKinzy Uselton has her hands full in the Nor-Cal Automove Legends division. Her lead over Tyler Peach is a mere four points. In third is Brent Mack who’s still in the running as he’s only 12 points behind Uselton. Brad Curtice is 34 points in arrears to the leader while Dominic Vogelsang is five points behind Curtice. John Lally has a huge lead in the Fortuna Wheel & Brake bomber division. Lally’s lead is 48 points. Second place features a tie between Kolby Jackson and Bethany Rapp. Jim Redd is fourth but well out of the running for the track title as he is 97 points behind Lally. Kimberly Sorrels is fifth, only a single point behind Redd. Brian Murrell, Sr. has had a grasp on the top spot in the Humboldt Hydroponics mini stock class since the beginning of the season. Eugene Palmer has been right on his heels and is only 12 points behind the leader. Brett Murrell has slowly been gaining ground every week and is third in points, 18 behind his father. Two rookies round out the top five and both have had impressive seasons. Scott Taylor is fourth while Trevor Eacret is fifth. The championship in the Lone Star Junction Thunder Roadster class was turned upside down in the most recent race on August 5th. Ronnie O’Neil took over the lead in the standings but is only four points ahead of Tommy Payne in second. Paul Peeples, Jr. was absent in the last race and lost his points lead. He is 18 points behind O’Neil. Jason Mitchell is the top rookie in the Thunder Roadsters and is fourth, 58 points behind O’Neil. Chris Lawrence is only one point behind Mitchell in fifth. The Mid City Motor World Super 6 Late Model Challenge Series division will have their final points paying race for the track championship at the Acres this weekend. The series is also presented by Anderson Logging, Danielson Construction and North Coast Lighting And Electric. It will be a battle between the top three drivers, Mic Moulton, Eric Gannon and Marty Walsh. Moulton holds a seven point advantage over Gannon. Walsh is only eight points behind. Brandon White has been a strong contender all year long and is fourth in the standings. David Henderson is fifth. Going into the weekend, four drivers are locked into the two-race Super 6 Late Model Challenge Series championship playoff at the season ending races at Redwood Acres Raceway and Ukiah Speedway. Four drivers have locked in thanks to winning the first five events. Those drivers are Moulton, Gannon, White and Henderson. Because White won two of the feature events in the series, there are two positions left for the two-race playoff. Walsh will have to have serious problems on Saturday night to knock himself out of condition for the fifth playoff spot while the sixth and final playoff spot will likely be determined between Ryun Leazer and Kenny Demello who are separated by only one point. Saturday grandstands open at 5 PM with racing starting at 6 PM. Besides all of the racing on track, there will be a meet and greet on the front stretch between the heat races and main events. Fans will be able to see their favorite drivers in all the divisions. Additionally, the annual Murrell 500 will take place between the Murrell family. Racing at the Acres this weekend will continue into Sunday August 27th as the outlaw karts return to action for Harper Motors Day at the Karts. All six divisions will be in action including the beginner box stocks, the UAS Speedway Karts, the Williamson Financial box stocks, 250s, Speedway/old fart karts and the 500s/open karts. Mud packing begins at 11 AM with qualifying and racing following. DAYTONA BEACH, Fla. — The NASCAR K&N Pro Series West schedule heads to Douglas County Speedway in Roseburg, Oregon, for the Clint Newell Toyota 150 presented by NAPA Auto Parts on Saturday, August 26. Below is a look at the race itself and some of the selected participants. • Chris Eggleston of Erie, Colorado, won last time out at Washington’s Evergreen Speedway from the pole for his fourth win of the season, moving him to within just two points of NASCAR K&N Pro Series West leader Todd Gilliland with four races remaining. • The win was the fourth of the season for Eggleston as he seeks his second career series championship. • Gilliland, of Sherrills Ford, North Carolina, has five wins this season and led a race-high 114 laps at Roseburg last year. • This will be the series’ 15th visit to the .375-mile oval, dating back to its first trip in 1966. • Located at the Douglas County Fairgrounds in Roseburg, Oregon, the oval is the state’s premiere paved oval. • The track is operated by the Pacific Racing Association (PRA), a non-profit group. • Ten different winners have been celebrated in the previous 14 events held at the track, with Eric Holmes leading all drivers with three career victories. • Eric Holmes has the most wins at the track with three consecutive victories from 2008-2010. • Jack McCoy and Austin Cameron are the only other drivers with multiple victories at Roseburg with two wins apiece. • Mike Duncan, Eric Holmes and Jack McCoy have collected the most poles at Douglas County with two each. • Eric Holmes has the most top fives (five) and top 10s (five) at the track, where he has never finished worse than third in five career starts. • Sits ninth in the championship standings with two top fives and six top 10s in 10 starts. • Matched her career-best finish of fifth in the most recent race at Washington’s Evergreen Speedway. • Finished 10th in her only NASCAR K&N Pro Series West start at Roseburg last season. • Sits second in the overall West standings, just two points behind leader Todd Gilliland, with four wins, nine top fives and 10 top 10s in 10 races. • Has nine career K&N West wins with 28 top fives and 32 top 10s in 41 career starts. • Was the 2015 series champion in his first full season of competition with Bill McAnally Racing. • Is the only driver to finish in the top 10 in every race this season and has wins at Arizona’s Tucson Speedway, California’s Orange Show Speedway, Colorado National Speedway and Evergreen. • Leads the K&N Pro Series West with top fives in nine of 10 races this season. • Finished seventh last season in his only career start at the Oregon short track. • Has five wins, seven top fives and nine top 10s in nine West races this season to lead the series standings by two points over Chris Eggleston. • Won the first five pole awards of the season and four straight races — Kern County, Irwindale (twice) and Spokane. • Won last month at Iowa for his series-leading fifth win of the season. • Won four of the first five K&N Pro Series West races this season and owns 12 career K&N Pro Series West wins. • Finished 12th in the most recent race at Evergreen, his first finish outside the top 10 since Sonoma in June of 2016. • Led a race-high 114 laps at Roseburg last season before finishing sixth in his only career start at the track. • Sits third in the current West standings with five top fives and six top 10s through 10 races. • Won his first career pole at Iowa, but enters Roseburg with back-to-back 11th-place finishes — the first time he’s finished outside the top 10 in consecutive races in his career. 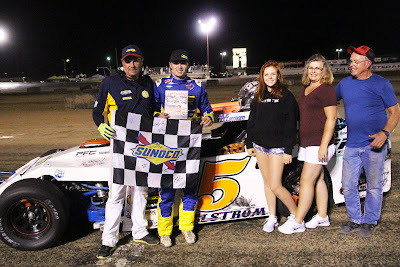 • Finished a career-best second at Kern County in March and equaled the effort at Washington’s Spokane County Raceway and Colorado. • This will be his first series start at Roseburg. • Sits seventh in the overall standings with five top 10s in 10 starts this season. • Finished fourth in the K&N Pro Series West standings in 2016, the highest finish for a woman in the series’ history. • Has posted season-high finishes of sixth on three occasions this season, at California’s Irwindale Event Center, Colorado and the most recent race at Evergreen. • Finished fifth last season in her only series career start at Roseburg. • Despite missing the season opener, is fifth in the standings with four top fives and nine top 10s in nine starts. • Finished a season-high third at Irwindale in March. • Has six career K&N West wins, including two at both Minnesota’s Brainerd International Raceway and Iowa Speedway. • Finished 17th in his only career start at Roseburg back in 2010. • Making his season debut with Jefferson Pitts Racing. • In three career series starts, has two top-five finishes including a career-high of third at Idaho’s Meridian Speedway in 2015. • Is the Pro Late Model point leader at Madera Speedway in California. • Has never competed at Roseburg. • Ranks fourth in the West standings with six top fives and eight top 10s in 10 races this year. • Matched a career-best finish of second last time out at Evergreen, giving him two second-place finishes in the last three races, including at California’s Sonoma Raceway. • Competed in six races last year and is running for K&N Pro Series West Rookie of the Year this season. • This will mark his first K&N Pro Series West start at Douglas County. • The 2017 season is the 64th for the K&N Pro Series West. • The 2017 schedule features 14 races at 12 different tracks. • Point leader Todd Gilliland, who won the first five poles of the season, swept the Twin 100s at Irwindale in March as part of a stretch of four straight wins. • Gilliland won at Iowa Speedway for his fifth win of the season. • Chris Eggleston won the season opener at Tucson and then two straight events at Orange Show and Colorado National. • Eggleston won the most recent race at Evergreen for his fifth win of the season. • Monster Energy NASCAR Cup Series driver Kevin Harvick is the only driver other than Gilliland and Eggleston to win a race this season, winning on the road course at Sonoma in June. MADERA, CALIFORNIA (August 22, 2017) – The sixth night of MAVTV-televised Late Model racing at Madera Speedway hits the track on Saturday night with the RPM Mortgage Pro Late Models 100 and 51FIFTY Energy Drink Jr. Late Models 75 ready for action. Joined by Legends of the Pacific, Mini Cups, and Modified Super Toyotas, nearly 300 laps of competition is on tap on the fastest one-third mile in the west. The RPM Mortgage Pro Late Models will be competing for $2,000 to win and perhaps in their most wide-open field of the season. 2015 champion Buddy Shepherd of Bakersfield, the current points leader, will be absent to compete in a K&N West Series event. With Shepherd out, arguably the driver to watch will be Upperlake, CA's Jeremy Doss. Doss, a two-time Pacific Challenge Series champion, will make his first points paying start at Madera after showing impressive lap times in testing last October. The 19-time PCS race winner is also a four-time SRL Southwest Tour winner and 2013 SRL Rookie of the Year. June 17th winner Logan Zampa of Napa is second in series points and trails Shepherd by 47 markers. With a 46.8 point average over the course of the season, Zampa has a strong chance to take over the points lead. Zampa finished 14th to open the year but has followed that with a win, two seconds, and a third place. Trailing Zampa by just nine points is Modesto's Garland Tyler. Tyler has not yet won a feature in the series but has two seconds and two thirds on his resume this year. Fourth in the standings is Madera Ranchos' Dillon Tucker with a third place finish in the season opener as his highlight. 2016 champion and winningest driver Matt Erickson ranks fifth on the strength of the season opening win. Erickson has not finished better than fourth since then, however. Sixth in the standings is Austin Herzog with five career 51FIFTY Jr. Late Model wins. Twice Herzog has run in the top-five late in a race only to finish deeper in the pack. Ryan Hart, Howard Holden, Glen Cook, and former track champion Rick Thompson make up the rest of the top-ten. The 51FIFTY Jr. Late Models has been dominated by 12 year-old Jesse Love IV of Menlo Park. Love opened the year with three consecutive wins before a third place finish in June. He finished seventh in July after a mix-up with race leader Kolby Berry. The two hiccups have not stopped Love from commanding an impressive 45 point lead over teammate Hailie Deegan. Berry is third in the order on the strength of four fast-times in the five races so far. April 2016 winner Austin Edwards is fourth overall. Eric Nascimento, Jr. claimed the July 29th race and also finished in the top-five with the Pacific Challenge Series at Madera two weeks ago. The 16 year-old has moved up to fifth in the Jr. Late Model standings. Two out of state female drivers will compete with the series with North Carolina Legends standout Gracie Trotter driving in place of Deegan in the #88 Toyota-backed entry this weekend. Vermont's Peyton Lanphear is expected to make her second start in the series, driving for Nascimento Motorsports this time around. The popular Legends of the Pacific will return for the fourth time this year. The Legends have not had a repeat winner in 2017 at the speedway with Luis Tyrrell winning most recently in July. A 35 lap main event is scheduled. Las Vegas' Tyler Reif has been impressive in his rookie Mini Cup campaign and will look to extend his winning streak to four in their 20 lap main event. Stockton's Joey Stearns gave Reif a strong challenge in July that thrilled the crowd. The Modified Super Toyotas are led by Zachary Cook who also competes in the Late Model division on a part-time basis. Cook leads Dave Lander by just five points with fellow Late Model rookie Patrick Geiger in third. MSTs are scheduled for a 25 lap main event. An open practice kicks off the weekend on Friday before a full day of action on Saturday. Friday practice runs from 5 p.m. - 8 p.m. On Saturday, pit gates open at 11:30 a.m. with practice from 1:30 p.m. - 3:30 p.m. Qualifying will follow with B Mains and Heat Races beginning at 5 p.m. Opening ceremonies and main events will follow at approx. 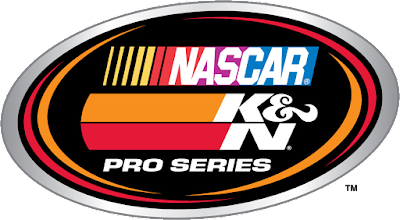 5:30 p.m.
DAYTONA BEACH, Fla. — The NASCAR K&N Pro Series West returns to the state of Oregon for the Clint Newell Toyota 150 presented by NAPA Auto Parts on Saturday, August 26, at Douglas County Speedway in Roseburg, Oregon. Douglas County is a .375-mile facility located inside the Douglas County Fairgrounds — featuring an historic covered grandstand — hosted its first NASCAR K&N Pro Series West race in 1966. After a five-year absence from the track, the K&N Pro Series returned last season in a race won by Ryan Partridge, who became the series’ 10th different winner all-time at Roseburg. And while the track itself offers beautiful mountain views all around it, most eyes will be on the K&N Pro Series West championship battle, which only seems to tighten with each passing race. Chris Eggleston of Erie, Colorado, won his fourth race of the season last time out at Washington’s Evergreen Speedway and moved within two points of leader and defending series champion Todd Gilliland with only four races remaining. Gilliland, of Sherrills Ford, North Carolina, has won five of the 10 races to date. History offers little indication of who might hold the upper hand this weekend: Both Gilliland and Eggleston made their only career starts at the Roseburg track last season, finishing sixth and seventh, respectively. EVENT SCHEDULE: Saturday, August 26 — Garage opens: 12 p.m.; Practice: 3-3:45 p.m.; Final practice: 4-4:45 p.m.; Qualifying: 5:15 p.m.; Driver autograph session: 6:30 p.m.; Clint Newell Toyota 150: 8 p.m. The Race: The Clint Newell Toyota 150 will be the 11th of 14 races on the 2017 NASCAR K&N Pro Series West schedule. The Procedure: The starting field is 22 cars, including provisionals. The first 18 cars will qualify through the group qualifying process with the remaining four spots being awarded through the provisional process. The race is schedule for 150 laps covering 56.25 miles. The Track: Located at the Douglas County Fairgrounds in Roseburg, Oregon, the .375-mile oval is the state’s premier paved oval. This will be the tracks 14th visit to the track. Ten different winners have been celebrated in the previous events. Race Winners: There have been 10 different winners in the 14 NASCAR K&N Pro Series West races held at Douglas County Speedway. Eric Holmes, who won three consecutive from 2008-10, has the most career victories at the track. Track Records: Mike Davis holds the track qualifying record set at 119.276 mph on June 30, 2007. In 150-lap events at Roseburg, Eric Holmes holds the race record of 62.616 mph (53 minutes, 54 seconds) sent in July of 2008. BMR Has A Handle: Until Ryan Partridge snapped the streak last season, Bill McAnally Racing had won five consecutive races at Roseburg — certainly a good sign for BMR teammates Chris Eggleston, Todd Gilliland and Derek Kraus this weekend. Peyton Sellers kicked off the streak with his win in 2006, followed by Brian Ickler in 2007. Eric Holmes then won the next three consecutive races at Roseburg, making him the only three-time winner in series history at the track. When Gilliland won the pole for last year’s race, it marked the third time in four races — and fourth time in the last six — that BMR teams had won the pole at Roseburg. Up Front: Starting position has been key at Roseburg. Half of the 14 series races in history at the track have been won from the pole, while three others — including each of the last two — have been won from the outside of the front row. No driver has ever won at Roseburg from outside the top five starting positions. Jack McCoy (1966) and Johnny Steele (1968) are the only drivers to win from further back than fourth, each started fifth. Rookie Battle: The Sunoco Rookie of the Year Award continues to be a battle this season. While Derek Kraus holds a five-point advantage over Will Rodgers in the official rookie standings, the two drivers sit much closer than that in the overall standings. Kraus is third, just one point ahead of Rodgers. Rodgers has more top fives (six) and more top 10s (eight) than Kraus, though Kraus has finished second on three different occasions this season — at California’s Kern County Raceway Park, Washington’s Spokane County Raceway and Colorado National Speedway — and he knocks on the door of his first K&N Pro Series West win. 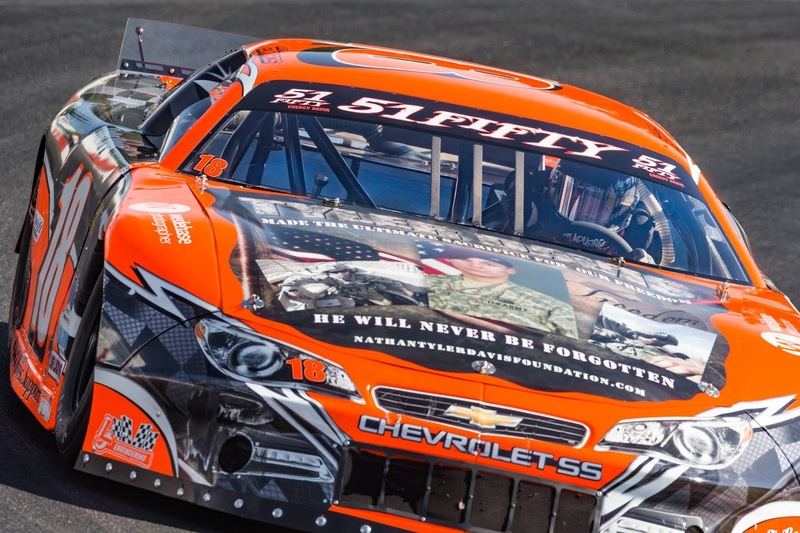 Shepherd Is Back: Bakersfield, California, driver Buddy Shepherd will be making his fourth career appearance with the K&N Pro Series West when he pilots the No. 27 for Jefferson Pitts Racing at Roseburg. It will be Shepherd’s first career start at Roseburg. Shepherd has two career top fives in three career K&N Pro Series West races, including a career-best finish of third at Idaho’s Meridian Speedway in 2015. In his short track career, the 17-year-old driver already has nearly 60 career wins combined in both asphalt and dirt competition, and this summer he’s already won in Pro Late Model and Super Late Model competition. August 19, 2017 Ukiah, CA...... After setting fast time over the 22 car field, Kyle Tellstrom of Ukiah started 10th, made the winning move on Eric Johnson of Kelseyville on lap 26, and never relinquished the lead to capture race #8 of the North State Modified Series, presented by Protect the Harvest, at Ukiah Speedway Saturday night. Charlie Collins finished second earning enough points to take over the NSMS points lead from Darrin Knight. Johnson and Richie Potts ran one-two the first 3 rounds with Darrin Sullivan and Andy Vanderveer next in line. Cameron Austin swapped places with Vanderveer on lap 4, and Charlie Collins drove under Vanderveer for fifth on 8. Vanderveer regained his position as Tellstrom traded places with Collins, dropping Collins back to 7th. Lap 11 saw Potts push high allowing Sullivan to assume the second slot. Austin dove under Potts for third the following round. While Potts was stuck in the outside groove he lost several positions. Both Tellstrom and Collins ducked under Austin on lap 18 and set their sights on the leaders. This third yellow set the stage for a single-file restart with Johnson in the lead. Tellstrom drove around Sullivan, moved to the high side and rubbed fenders with Johnson for two laps before pulling away. The field had just hit the half-way mark when when Adrianna Strugnell's car hit the infield dirt, shot back on the track tagging Ross English. English lost control and slammed hard into the front-stretch concrete. When racing resumed Collins swapped places with Sullivan as Tellstrom was pulling away from the pack. Knight joined the front runners, took fourth away from Sullivan on lap 36, and challenged Collins for third on lap 40. As the three battled for position, Sullivan and Knight crashed together resulting in Knight driving off the asphalt in turn one. The final 20 laps saw Collins drive by Johnson and set his sights on Tellstrom. Jason Philpot drove around Austin for fourth on 45, as Sierra Furia was holding off the challenges of Price. Collins caught Tellstrom on the white-flag lap, and at the checkered flag it was Tellstrom, Collins, Johnson, Philpot and Austin. Rounding out the top 10 were Furia, Price, Dustin DeRosier, Knight and Barba. Vanderveer collected $100 for his win in the Lucas Oil Dash for Cash with Cody Braund getting $50 for second. Keyser Hard Charger Award, went to Codi Barba, Collins received the Naake Suspension Award, the DJ Safety Certificate went to Sal Lopez, and Sierra Furia got the Racer Bling Award. Scribner Plastic jugs went to Vanderveer and Braund. At the start of the feature Knight had a seven point advantage over Collins. Now Collins is out in front by seven points over Knight. There are only three races left in the NSMS championship race. The next race is at Redwood Acres Raceway in Eureka on September 9.